This is an amazingly powerful lightning strike quartz from Brazil. She is a very light citrine with tinges of smoke, 5.8 oz and 3.3" by 1.5" by 1.6" and is totally shaped by lightning strikes, most of which danced across her faces and sides ALL over, leaving an assortment of strikes all over her, leaving a bit of strike damage at the facial edges are terminal apex. Inside, you can see areas of light (and an occasional little rainbow) where the lightning traveled through her core as well. She has a channeler termination and a slanted and healed base as well as a healed conchoidal ding on a facial edge. There are delicate Lemurian lines and she has a few odd tiny dings unrelated to the lightning strike, but considering her history, she’s in remarkable condition and ready for her forever Keeper. My first lightning strike quartz actually happened to me. I had a particularly intense meditation and at the end, I went to set the crystal on the table as I got up. The room was dark and as I reached for the table, there was a flash of light and an audible pop and I felt a piece of the crystal hit my palm! This was some time ago and I'd never heard of lightning strike quartz, so I thought the crystal was ruined! There was a gash running nearly her whole length, all cross-hatched. She was extraordinarily hot too! 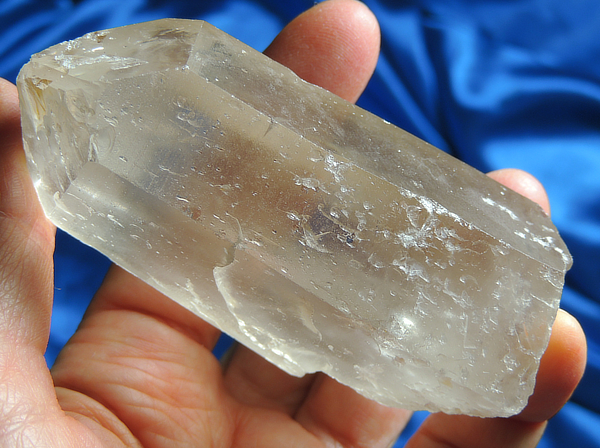 I emailed a friend and she explained what had happened – and my quartz was far from ruined – she is one of the most intense crystals that it has been my privilege to know – and she is a perennial meditation favorite! Interestingly, this process is similar to what happens when the crystal is in the ground. Lightning strikes in the vicinity and the current created leaves these marks on the surfaces. As I said, I’m over the moon with these quartz – they are so varied and so mysterious. Interestingly, this Spirit seems best matched for a Keeper looking to express his or her own power in a positive, beneficial manner. Women, in particular, don’t totally express what is on their mind, trying to be cognizant of opinions and feelings of others. This is an important consideration, but many times we sacrifice our own feelings and opinions and totally allow only those of others. This leaves a sense of frustration and a lack of self-worth. But the struggle isn’t restricted only to women. Within the glow of protection from her citrine soul, she offers a surety and security about Self that allows full expression without hurting another. Trust that you will find the words and the means and then permit it to happen. The sense of freedom will be inspiring and freeing!